It seems a simple thing, to draw a bow cross the strings of a cello. Yet, in Venice’s church of San Vidal the long low note reverberates, a deep tone that shakes the very foundation of the church, causes goosebumps and, often, tears. A concert by Interpreti Veneziani has begun. Every time I return to Venice, on either my first of second night in the city, I go to San Vidal. If the concert is sold out, I simply stand outside the church, within an enwrapping Venetian shadow, and listen to the music inhabit the air, the space around me. If I am lucky enough to find a ticket and seat in the church, it is then that the true magic happens. On an evening in mid-October, I sat quietly as the lights dimmed. The spot lights on the performers brightened. The cellist for the group took center stage. The effect of his placing the bow on the strings of his instrument, then drawing the bow across one single string, brought tears to my eyes. It was as if time moved instantaneously back to the Renaissance and I was a ghost of some future, a spirit who sensed the mysterious effect of great music on the human soul. Click on the link below and enjoy a movement from one of Vivaldi’s lesser known works, this from his Concerto per Archi in Do Maggiore. If you are ever in Venice, GO. 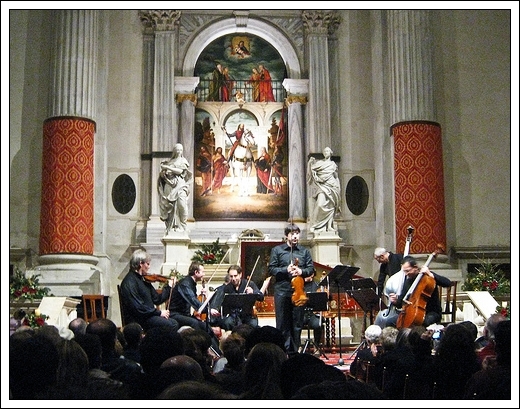 Concerts are performed nearly every night by the Interpreti Veneziani. Of the many options available to visitors for evening concerts in the city, I can only recommend this one. Enjoy. Experience. Feel.